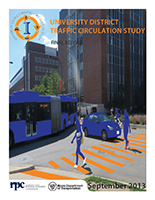 The Champaign County Regional Planning Commission (CCRPC) received a grant from the Illinois Department of Transportation (IDOT) in 2011 to conduct a traffic circulation study for the University of Illinois at Urbana-Champaign’s University District. The Campus Area Transportation Study (CATS) Technical Advisory Committee is the study steering committee. The University of Illinois at Urbana-Champaign is the largest public university in Illinois with more than 50,000 students, faculty, and staff. Uniquely situated within two cities, the University is the region’s economic, cultural, and geographic center. The University is facing tremendous challenges associated with growth, land use, travel, and public access to the University Campus area; generally within the boundaries formed by the Canadian National Railroad Track, Windsor Road, Lincoln Avenue, and University Avenue. The essence of the challenge is finding ways to facilitate travel to, on, and around campus as safely and efficiently as possible, without compromising personal safety, the quality of campus life, the environmental setting of the campus, and the academic mission of the University. Transportation and circulation within and surrounding the University should maintain a balance of travel modes, along with providing a sense of order and convenient access. Also, pedestrian and bicyclist safety issues have been at the forefront of the University and community consciousness over the past several years. In the past ten years, three students were killed while walking or biking on campus. Two of the pedestrians were killed by public transit buses while they were turning. This study aims to enhance pedestrian and bicyclist safety on and around campus as the first priority established by the Campus Area Transportation Study (CATS) Committee, followed by buses and automobiles. The study intends to provide transportation systems which would contribute to a pleasing environment for individuals who attend, work at, and visit the University, as well as those who live in the adjacent neighborhoods. Providing a clearly organized system of pedestrian, bicycle, transit, and vehicular facilities is vital for creating this environment. Improving traffic circulation and way finding, increasing the use of active travel modes (e.g., walking, biking), encouraging modal connectivity and securing funding are essential to meet the transportation needs in the University area. To identify improvement needs to the existing traffic circulation system in the campus area. To create a pedestrian, bicycle, and transit-oriented circulation system in the campus, while maintaining necessary access for emergency and service vehicles. Recommending traffic management (including parking consolidation) and control strategies for University related traffic to ensure a safer and smoother transportation network for the campus area and the area surrounding the campus.